Priety’s married! For real now, because we have pictures. Including photos of her husband “Gene Goodenough” (still sounds like the name of a cartoon character). First, of course, Priety herself! Her face seems back to it’s dimply self (thank goodness! ), and that dress is gorgeous. And the perfect “red for the bride but not bride-y because it’s not really a wedding” kind of look. Also, her husband looks fine. Everyone nailed the Indian wedding but not quite kind of look, really. Lots of gorgeous distinctly Indian fabrics, but with slightly more western looks. Madhruri and Dr. Nene looked fantastic, for instance. For once she wasn’t in a sari, and her hair is pulled back, and she looks better than ever! Dia went a little more western, and a little more revealing, in a little cocktail dress look, but she still had the rich fabric and embroidery. I kind of loved Shahid’s wife’s look. The embroidery on the top is so fun and sparkly, and it fits just right even over her (now officially confirmed) pregnant belly. Oh, and Shahid, as always, is wearing a slightly tight suit and a slightly skinny tie. Big news on the rumors front, Iulia Vantur seemed to arrive as part of the Khandon group! Atul Agnihotri and Alvira and Iulia and Salman all arrived as a group. Also, I think Alvira’s dress doesn’t fit quite right, and the belt is too big. But Iulia’s dress fits perfectly, and the color is just right on her. Lara Dutta was one of the few who opted for a sari, but it’s still not a traditional one, more chiffony and jeweled, less thick silk and folds. 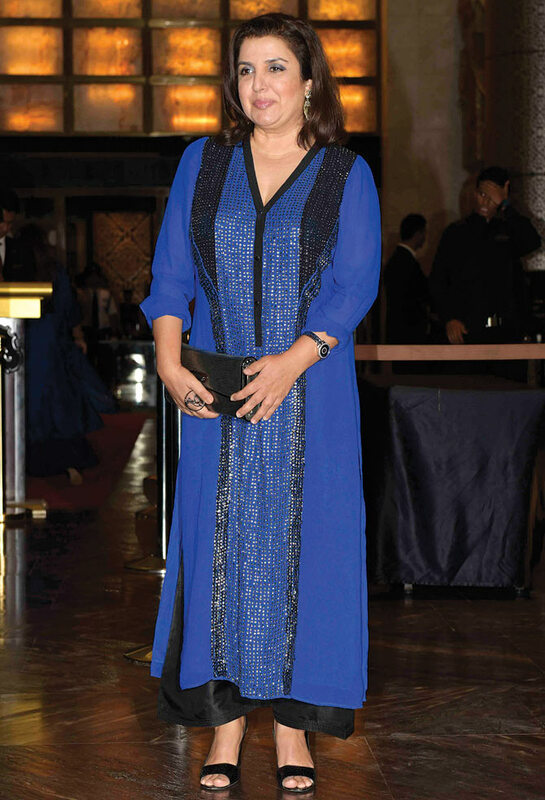 Like Madhuri, Juhi opted to go non-sari. And she looks great! And managed to find a red top that still isn’t too trying-to-show-up-the-bride red. But I think I might like the color Farah went with the best. And I just realized that I have a shirt in the exact same color, which I love! The shirt, not the fact that I have it. Sush looks gorgeous, as always, with a kind of Katherine Hepburn slacks and top free moving vibe to it. 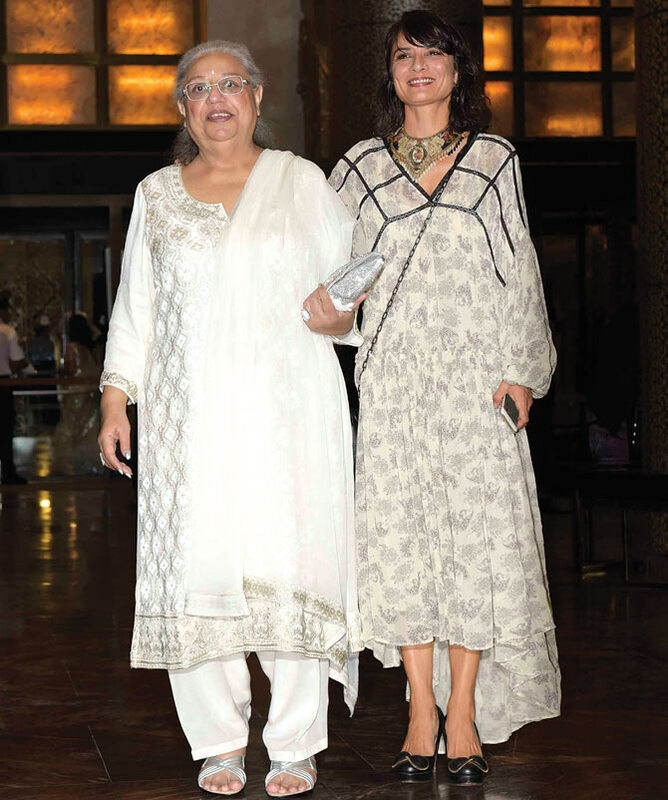 Honey Irani and Adhuna Akhtar arrive together, which is so odd! Because, first, you almost never see Honey in public. And second, isn’t Adhuna in the middle of divorcing Farhan? A little odd that she is still going around with her mother-in-law! Or maybe Farhan is getting Javed and Shabani in the divorce, and Adhuna is getting Honey? And finally, most importantly, DAMN! Shahrukh looks GOOD! This entry was posted in Uncategorized and tagged Filmi News You Can Use, Juhi Chawla, madhuri, Priety Zinta, Shahukh by mredlich21. Bookmark the permalink. Best of luck to Priety and Gene! And yes his name is a bit cartoony but I’m glad Priety finds him good enough.Terrible pun.But he looks a bit uncomfortable with all the media attention.Didn’t he know Priety used to be a big name in Bollywood?Dr.Nene had pretty much the same reaction on seeing Madhuri’s popularity in India.But then she was at the top of her game then.Priety not so.And she’s pretty much unrecognizable after all the work she’s got done on her face. I hope Gene gets to enjoy it, like Dr. Nene. i love the way he just goes around with Madhuri now! And he always seems so happy about it, like he gets a big kick out of how popular she is.